These Orange Dream Pops taste just as good as the ones from the ice cream truck, but they're much healthier! A great kids recipe to try on a hot summer day! 1.In a big bowl, mix the partly thawed orange juice and yogurt together until well blended. 2.Scoop into Popsicle mold or paper cups and freeze for 4-5 hours. 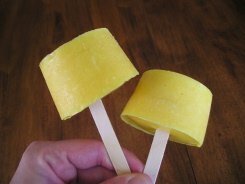 If you are using paper cups for your dream pops, your popsicle sticks should stand right up in your cup before you freeze them. If they don’t you can always put cling wrap around your cup and insert the stick through the wrap to keep it up right.